Robert (Bob) Pressler has been the owner of Kimura Bonsai Nursery in Los Angeles since 1996. He is a member of the California Bonsai Society and John Naka’s club Nampu Kai. He has studied with a variety of teachers, starting informally with Frank Okamura at the Brooklyn Botanical gardens in the early 70’s when he was a boy. 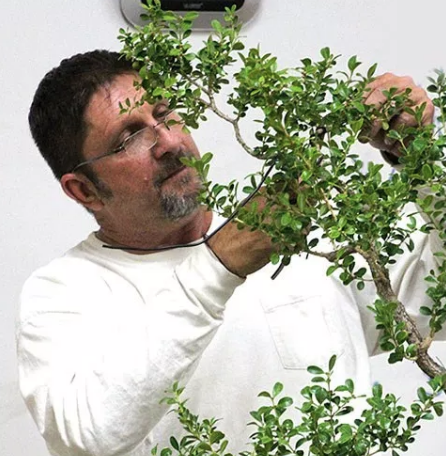 He moved to California in 1984 and a couple of years later meet John Naka, Ben Oki and the whole crowd of Southern California bonsai artists and clubs which really helped him expand his skills and gave him the opportunity to share them with others. In 2000 he met Kenji Miyata at a convention in CA and since 2001 has been studying with him. He conducts several classes a month at his nursery as well as demonstrations and workshops for clubs near and far and several conventions. Bob is conducting two bring your own trees (BYOT) workshops: 4 members in the morning from 8:30 to 10:30 and 4 members in the afternoon from 1:30 to 3:30. The cost of workshop is $30. Please sign up for this great opportunity to learn from a master. You can sign up below or contact Abe_Far@yahoo.com or call Abe at 619-384-0004.